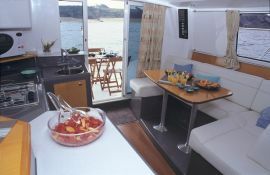 Overall Length : 34' 0"
Betty Jean is a new 2006 Fountaine Pajot “Highland” 35′ power catamaran. 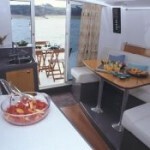 Her twin hulls provide a stable ride and room to relax. 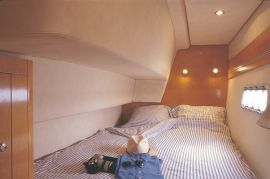 Each hull has an oversize queen bunk and its own head with shower. 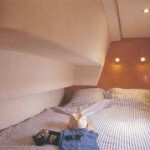 There’s no need to walk through other cabins or pass other bunks to use the head. There’s a third double berth in the main salon using a convertible settee, with plenty of room for two adults or several kids. The whole gang can hang out and watch a movie on the flat screen TV. Snorkeling and diving is easy from her twin sterns. There’s a Magna gas grill mounted in the cockpit, (please remember to purchase a gas cartridge when you shop for provisions and store these in the propane locker). 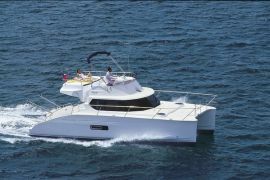 Betty Jean is perfect for cruising the Abacos with a shallow 3’1 draft, and economical twin diesel engines. With a fuel capacity of 2 x 105 US gallons diesel, she’s capable of cruising 1000 miles at 6.5 knots. Water capacity is 75 gallons. Relax with a “Bahama Mama” rum punch and enjoy spectacular sunset on the Sea of Abaco from the deck of the Betty Jean’s upper flybridge.